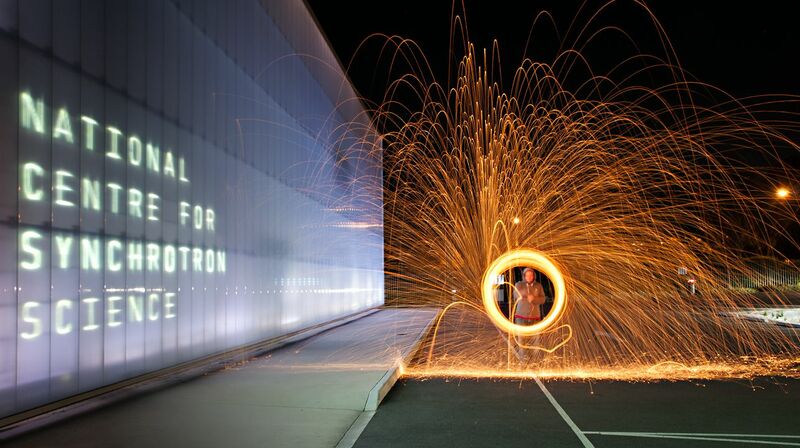 Thank you to everyone who entered the April-September 2014 photo competition at the Australian Synchrotron. The winner of the April-September 2014 photo competition is ‘A million bright ideas’ by Jason Price, Scientist with the macromolecular and micro-crystallography (MX) beamline team at the Australian Synchrotron. The judges liked the composition and technical execution of Jason’s attention-grabbing photo. They described it as a creative and visually-appealing photo that cleverly alludes to the nature of the synchrotron (orbiting electrons emitting tangential beams of light). Second place goes to ‘window’ by Terry Cornall, Senior Controls Engineer at the Australian Synchrotron. The judges liked this for the cool blue shades and straight lines that give the image a peaceful feeling, despite the comment left by a passing bird. Third place goes to ‘untitled (rainbow)’ by accelerator physicist Eugene Tan (AS). Is there a pot of gold at the synchrotron end of the rainbow? Fourth place (just a point behind third) goes to ‘SynchroEndTimes’ by Cameron Rodda, Senior Accelerator Operator at the Australian Synchrotron, described by the judges as surreal and post-apocalyptic; an interesting wide-angle shot with ghostly colours. Fifth place (two points behind fourth) goes to ‘untitled’ by Daniel Eriksson, Scientist with the synchrotron’s MX beamline team. The judges commented on the photo’s interesting forms and shapes, abstract quality and good use of colour contrasts, shadows and highlights. The deadline for the next round of the photo competition is Friday 27 March 2015. Photos must have been taken at the Australian Synchrotron. Send in your photo entries.